Even though the Costa Mesa Parks and Recreation Commission was not scheduled to hear the issue previously on the agenda, HERE, involving the proposed new rules for the Volcom Skate Park at TeWinkle Park, one interested party showed up at the meeting Thursday night to address the issue and was permitted to speak during the Oral Communications segment of the meeting. 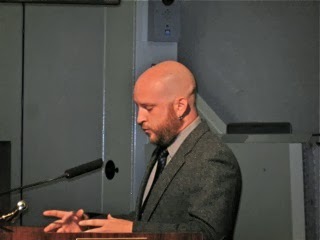 The speaker was Rocky Evans, who identified himself as an engineer and frequent skater at the skate park. He encouraged the commission to not change the rules to reduce the number of skatable hours each day, citing the probable over-crowding of an already busy facility and also that some children who take lessons during the hours planned to be cut would miss out on those opportunities. 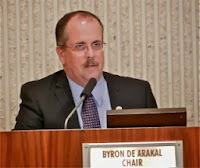 Chairman Byron de Arakal thanked him for his comments and then read the following statement into the record. At the end he encouraged Evans to be part of the solution to the issue and encouraged him to contact City Staff. I apologize to our park rangers, our police officers and the community. I had hoped tonight to begin reviewing options to make Volcom Skate Park a safer place for the skaters who use the park and follow the rules, and for our dedicated Park Rangers and Police Officers who place themselves at risk enforcing the municipal codes that govern the Volcom Skate Park. One of those options – which I had hoped to discuss tonight with the public and my fellow commissioners - is shortening the park’s hours of operation to noon to 8 p.m. during school year weekdays, and 10 a.m. to 8 p.m. during school year weekends. Apparently, a handful of folks think the planet will stop spinning on its axis if Volcom Skate Park moves from a 12-hour day to an 8-hour day. Shortening the hours, I was told, won’t solve the problem. No kidding. But what it would do is reduce by 4 hours the opportunity for skaters to use our city facility sans safety gear in open defiance of our municipal code. Equally important, it would reduce by 4 hours the risk exposure our Park Rangers and Police Officers encounter when attempting to cite defiant skaters. Now there seems to be a mentality simmering in some quarters out there that says since the city is technically in compliance with state law governing skate parks operated by public entities, we should do nothing else. We should let it go. Frankly, I’m dumbfounded by that thinking. In my opinion Volcom Skate Park is the most hazardous public park facility in the city. I witness young children to grown adults – often by the dozens at one time – flying around a confined space that’s nothing more than concrete and metal with edges and drops. And yet we satisfy ourselves that by the word of our municipal code and the signage at Volcom Skate Park we’re legally ‘covered’. That’s not good enough in my book. I don’t want to be sitting on this Parks Commission when that one, helmetless kid takes a dive and suffers some traumatic head injury or worse. 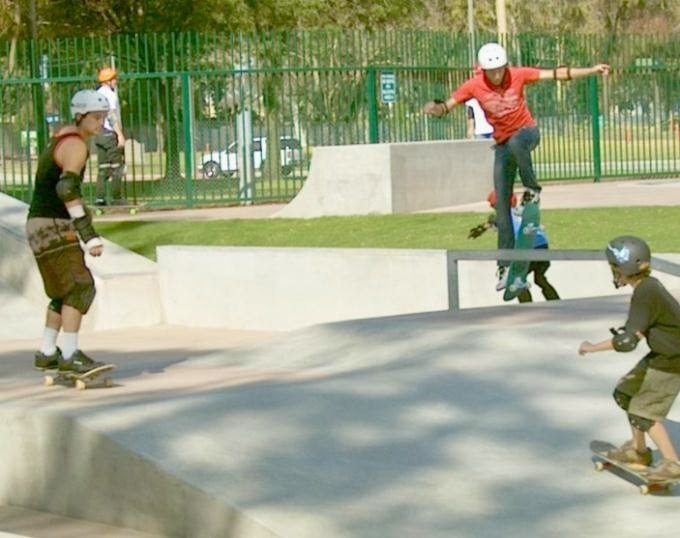 It is, in my opinion, irresponsible for Costa Mesa to operate Volcom Skate Park without requiring – not just by the word of law, but by the deed of enforcement – the use of safety gear by all who use it. For me, it has nothing to do with ‘risk management’ or ‘technical compliance with the law’ and everything to do with common sense and helping our residents stay safe when using a city facility. So, I again pledge to our park rangers and police officers that we will – in consultation with staff, the police department and the community – develop and implement a comprehensive solution to make Volcom Skate Park a safe place for all who wish to enjoy it, and for our Park Rangers and Police Officers who are sworn to uphold the laws of this city. Whatever that solution is its basic message must be this: If you want to skate at Volcom, wear your gear. Thanks for the report, Geoff. I asked Ernesto Munoz if it's possible to have a proposal ready to go for PRC's January meeting. He thought that was doable but will let us know for sure at our November 21 meeting. Just a thought - you might want to show you can handle the parks we already have before your boys try to build new ones.